Nuzzel is an amazing little app/web service that helps surface the news your friends and others in your network care about. Log into Nuzzel and connect your Twitter and Facebook accounts. Then, daily, or at an interval of your choice, you will receive an email containing the most shared links of the day from those in your network. The results even appear rank-ordered with the number of times shared, thumbnails of the sharers, and their comments about the link. 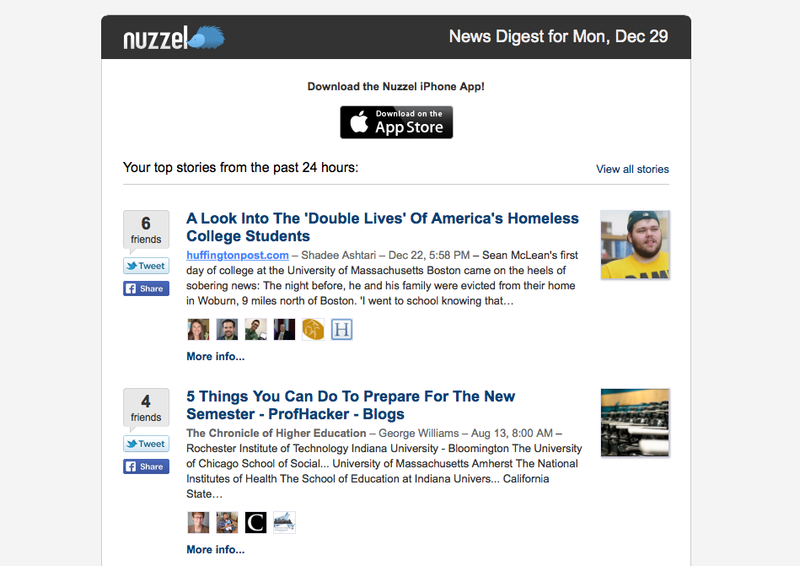 Nuzzel is a great way to make sure you don’t miss out on the news that your colleagues and friends care about. An example of my daily digest is below. Because I work in higher education, many of my friends do as well. Therefore, a lot of the links that surface in Nuzzel are typically of interest to me. Nuzzel also has an app if you’d prefer to access it that way. I’ve been using Nuzzel for a while now and I LOVE it. This is a post from my ongoing effort to highlight apps, web services, and vendors that may be of interest to higher education and student affairs professionals. I do not work for these companies, nor do I always endorse them, per se, but am sharing them to highlight tools that others may find useful. Have an example to share? Tweet me. ← The University-as-Theater: Are we just putting on a performance?